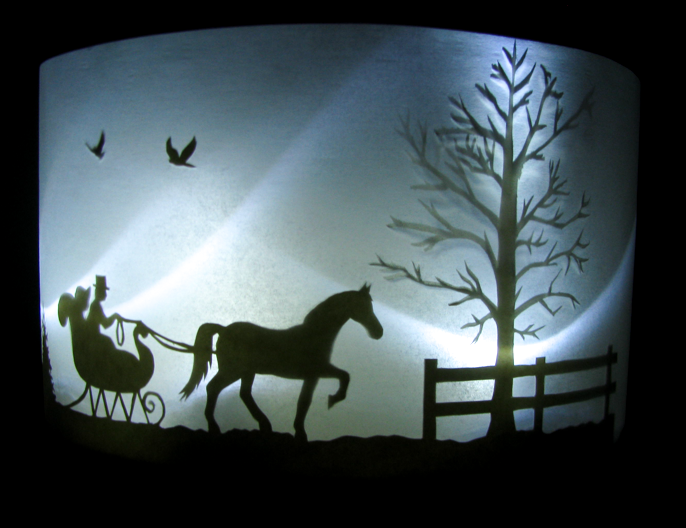 Wow your friends with an illuminated silhouette lantern cake! Learn how to make this fancy cake yourself with not-so-fancy (or too expensive) supplies! The lantern decorations are not edible, but to make them edible, just use wafer paper in place of the paper used in this tutorial and follow along with the instructions. Hope you enjoy and God bless! To begin making this cake, we must first plan our silhouette design! 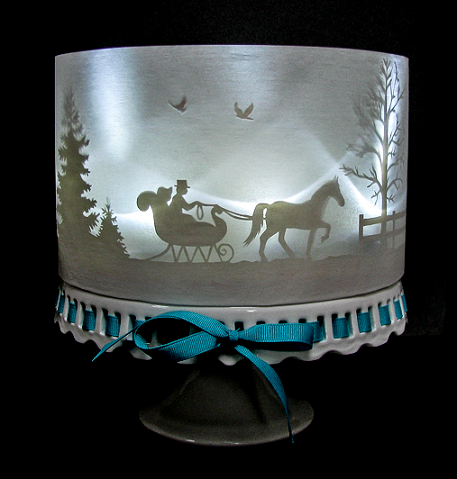 The idea for this unique cake came from the silhouette lanterns I made in art class using vellum paper and cardstock. This cake was for a friend's birthday, and she just loves snow scenes and horse drawn sleighs! So, the sketch above is what popped in my head, and it worked out beautifully! First, when planning your sketch you must figure out how tall your cake will be, including the height of the cake base it is sitting on. My cake will be about 5 inches in height, plus the 1/2 inch for the cake base means my lantern will need to be a little taller than 5 1/2 inches. I decided to make it easy on myself and make my lantern exactly 6 inches high. 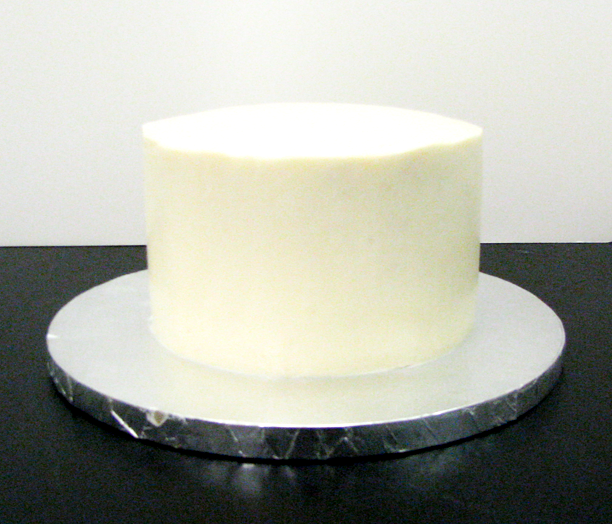 Next, I will be placing a 6" round cake on a 10" round cake base. So, I want to make sure my silhouette sketch will cover at least half of the front of the lantern (you can make your sketch go completely around your cake base - which will make life a lot easier when trying to stand the semi translucent paper up. The stiff silhouette paper will hold the semi translucent paper up.). But I didn't have a lot of time, so I had to make my sketch smaller. You can see the straight line above my sketch - this is the 6" ruler mark to ensure my sketch is the right height. The width of my sketch is 14", and I made this sketch on Strathmore Drawing paper (a good quality sturdy paper). 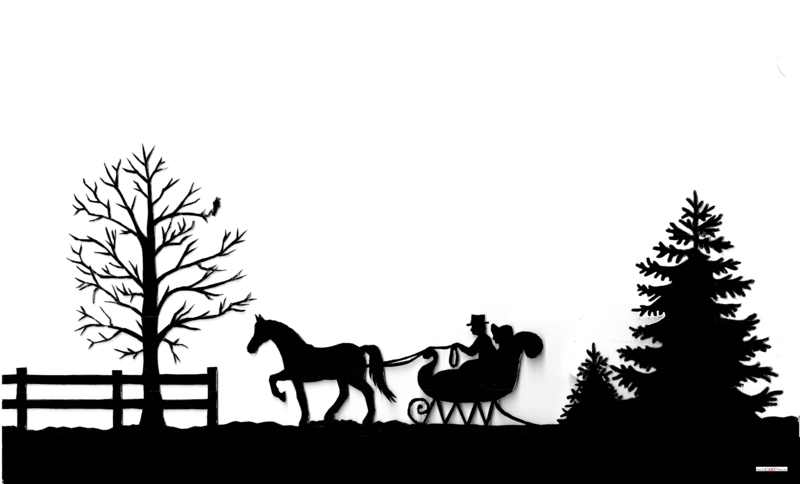 Update: If you love my Winter Sleigh Ride design, download your free template by clicking the button below! Feel free to use this template for your own personal cakes or for cakes you are selling! This template is owned by HowToCAKEThat.com, so please do not use or share this template digitally, such as on any other website or through email or messaging! Thank you :) Also, be sure to print the image large enough to suit your project. This template was created for a 10" cake drum, and the template should measure about 14" in length to fit properly. After your silhouette sketch is complete, laminate both sides of your drawing with clear masking tape. Using scissors, trim the excess paper off above the 6" line. 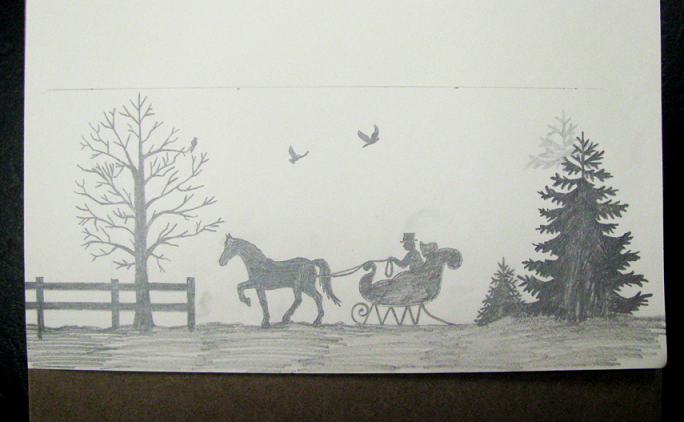 Next, tape the laminated sketch to a good quality sturdy paper (this paper will be the silhouette used on the cake). Cardstock would work well if you can find it large enough for your project. I ended up using another sheet of Strathmore Artist Quality Drawing paper for my silhouette cutout. Using an Xacto knife, trace around each detail in the sketch, being sure to use enough pressure to cut through both pieces of paper to cut out the silhouette design. If you own a Cricut machine, it would come in handy for this project. But I don't own one, so I have to do it the hard way ;). Ha ha! Remove the original sketch to reveal your lovely silhouette cutout. Not all of my pieces were completely cut through (especially around the trees), so I had to go back over with my knife and trim and neaten the edges. And don't forget the little birds! I cut them out, too, but they aren't in this picture. Oops! Now we're ready to assemble the cake! Place your cake on your cake base. I'm using a 6" cake on a 10" base. I could have placed an 8" cake on this base with plenty of room, so if you need more cake, feel free to do so. Now it's time to measure and trim our semi translucent paper. The paper I used for this project happens to be Parchment paper! I had other papers around the house that could have worked for this project, but of what I had, Parchment happened to have the perfect amount of cloudiness to it - not too cloudy, not too see-through. To trim the parchment, we must make sure we have a long enough piece. For a 10" cake base, I cut a 3 foot long piece - this makes sure there's plenty to go around and overlap a bit. Next, line up the bottom straight edge of the parchment with the bottom edge of your sketch. Fold the parchment over and form a crease at the height desired for your lantern, remembering to leave enough height to include your cake base. This crease will be a guideline for trimming. Use scissors to trim the parchment to desired height. Note: a good quality semi transparent paper would work best because it would be sturdier and wouldn't have the "nonstick" properties that parchment has. Next, using double-sided tape, tape the silhouette to the cake base. 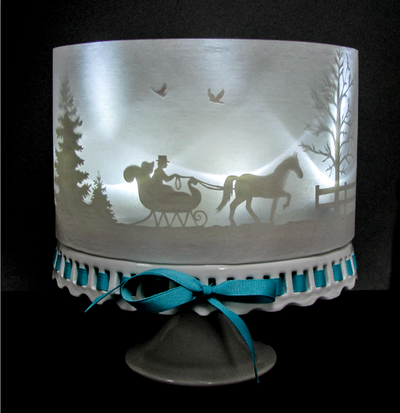 Using regular clear masking tape, secure the edges of the silhouette cutout to the cake base. 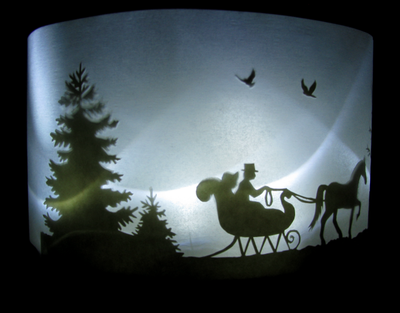 Place a few tiny pieces of double-sided tape on different parts of the trees, sleigh, and horse to ensure they stay close enough to the parchment so a clear, sharp image can be seen when light passes through the lantern. Also, place strips of double-sided tape all the way around the edge of the cake base and the bottom of the silhouette cutout to hold the parchment paper in place. Wrap the cake base and silhouette in parchment paper. 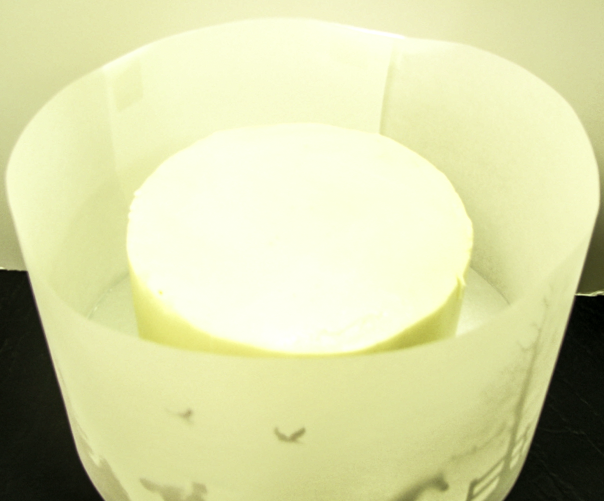 Be sure to press firmly around the edge of the cake base to ensure the parchment sticks to the double sided tape. Tape the top edges of the overlapping parchment together using masking tape. Next, tape the bird silhouette pieces into place using double-sided tape. Now it's time to set our lights in place. I'm using a set of submersible LED lights purchased from Michaels. 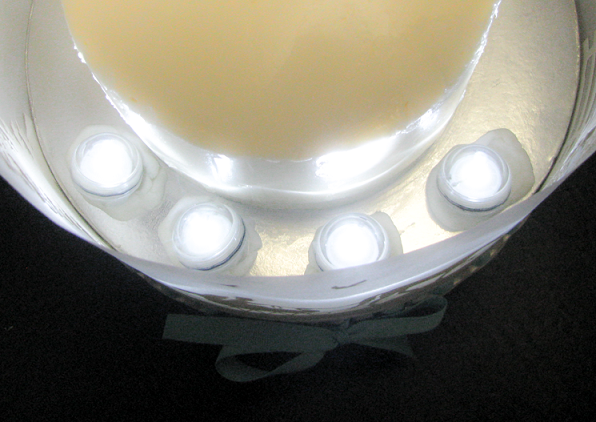 I had some extra fondant on hand, so I used small pieces of the fondant to stick the LED lights in place and ensure they don't roll around inside the lantern. And there you have it! A simple, gorgeous-looking cake made with supplies you probably already have around the house! Next time I make a cake like this I'll use wafer paper and show you how to make a completely edible lantern cake! Hope you have enjoyed this tutorial! God bless! !